Next up in our Printerette FAQ's series, we talk about all the different pieces you can include in your wedding invitation suite. There are endless combinations and we've seen them all! From simple invitations and envelope only, to 16 piece elaborate suites, the important thing is to make sure your wedding paper is a reflection of you and your wedding day. Save the Dates have become a common part of wedding stationery suites over the last few years. They're important to send if you're having a destination wedding or weekend long event that would require a majority of your guests to book travel or make extended arrangements. They're also great to send out if you want to make sure to give your friends and family plenty of time to plan for your event with crazy schedules and calendars that tend to fill up quickly. It's typical to get them in the mail about 6-8 months before the wedding. It's not always far enough in the planning process to have all of the specifics of the day sorted out, but thats ok! You'll want to call out who is getting married, the city and the date. You can get more specific later on in your invitation. Here at Printerette, we love that Save the Dates give the bride and groom the opportunity to have a little fun. You can use them as a way to set the tone for the wedding day or have them a little more relaxed and casual and more about your personality. Invitations include the most important pieces of information in any suite. You'll need to tell people they're invited, call out who's getting married, the day and time, and exact location. There are a number of ways to word them from ultra formal to fun and casual (We'll be working on a post about wording soon).As long as you get the information across, how you say it is up to you. You can also include reception information or direct them to your wedding website if you decide against some of the other pieces we'll get to. Invitations are also where guests are going to get the first impression of what your wedding will be like. Will it be a formal affair in a swanky reception hall? Or are you going to have a more casual get together at an outdoor venue with a BBQ? The design and wording communicates all of that to your guest and all of these possibilities is what makes designing them so much fun for us! While the debate about paper vs. digital RSVPs continues, you'll need a way for your guests to let you know they're coming and can't wait to see you! Paper Reply Cards remain the popular and preferred way for your guests to let you know who will be there. They can also be act as keepsake to look through again after the wedding. Using a Mad-Libs reply card or having special requests can make them extra fun! Website cards are sometimes being used in lieu of a traditional Reply Card. They direct your guests to your wedding website to RSVP, find more information out where to stay, and read more about the bride and groom. Chances are, you'll have a block of rooms reserved at a hotel or two for your guests. Accommodations cards are a great way to call out hotel options and local airports for your guests. Maps are a fun way to show your guests how to get from point A to point B and include a little personality along the way. After you've pointed out the necessary locations, you can have a little fun and add the restaurant you had your first date or the local coffee shop the two of you stop every Saturday morning. If you're having several events over the course of a long weekend, a timeline card can help keep your guests on top of when the welcome dinner is or where the brunch with yard games will be the day after the ceremony. These are great when you'll have a large group in town and want to have fun activities for all to enjoy! If you'll have a group attending a rehearsal dinner in the days leading up to the wedding, it's common to include an invitation for the dinner along with the wedding invitation. It's an easy way to include the wedding party and family members you may want to enjoy a more intimate dinner with before all the guests arrive. Similar to the rehearsal dinner invitations, brunch invitations are a great way to let guests know they'll have another chance to say farewell and best wishes the day after the wedding. 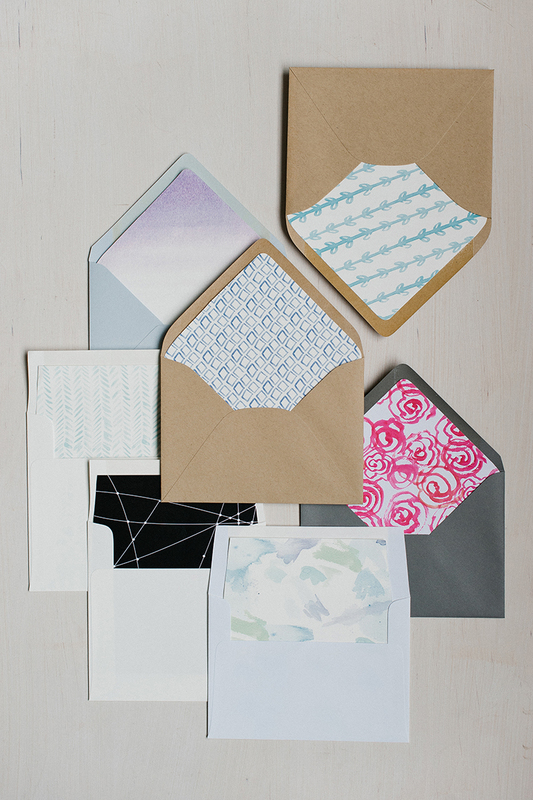 Envelope liners are an easy way to get a little extra pop of color or pattern in your invitation suite. It's a good place to have a little fun and let your personality shine through. A custom return address printed on the envelope, gives your guest a heads up that what they're about to open is going to be extra special. It can be formal calligraphy that matches the names on the invitations or include a sweet portrait of the two of you all dressed up for a walk down the aisle. With all these pieces, you might need something to keep them all together. A belly band is used to wrap around all of the different pieces and keep them organized when your guest pulls the invitation from the envelope. You can keep them plain or printed or get even jazzier with the options coming up. One of the extra special details that completes the wedding package is a wax seal. You can use this to seal envelopes or use to embellish the belly band. It can also make an appearance on other special pieces of paper like programs or menus. It can be a simple monogram of the couple or a symbol that's been used throughout the invitation suite. Another way to corral your invitation pieces is by using a ribbon and hang tag. The ribbon is a way to get a pop of color or metallic in your suite and the hang tag can be printed with anything from your monogram or sweet florals used in the invitation suite. The possibilities are endless! We're always happy to put together quotes for any combination and quantity of the items listed above. If there's something else you have in mind that we didn't talk about,chances are we can help you with that too! Stay tuned for our next FAQ post where we'll look at the different pieces you can incorporate on the day of the wedding!